3 Bdrm Terraced Dwellhouse. Ground flr: V/bule. Hall. Lounge/Dining area on open plan. Dining rm. Kitch. 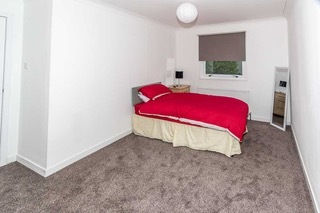 1st flr: 3 Bdrms, 1 with ensuite shower rm. Bathrm (CT band - D). Parking. 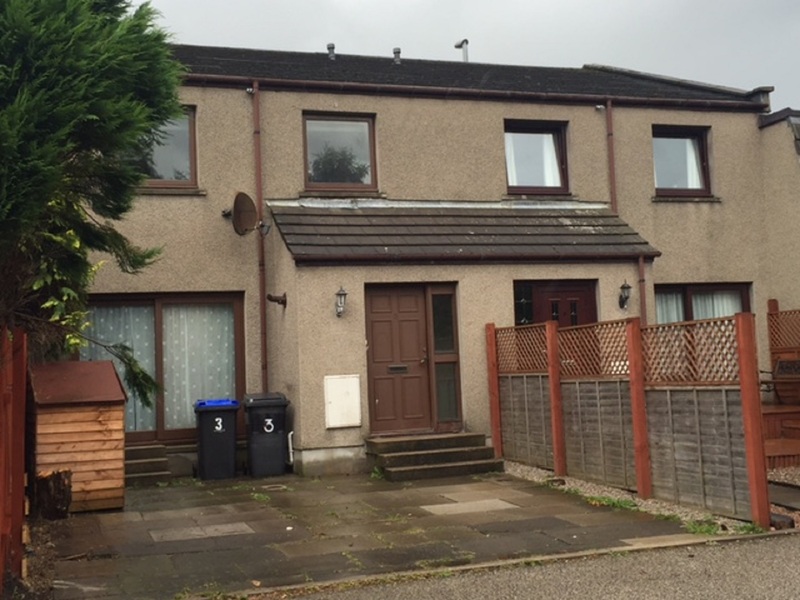 Price over £185,000 Entry by arr. Viewing 07999 226022. (EPC band - C). 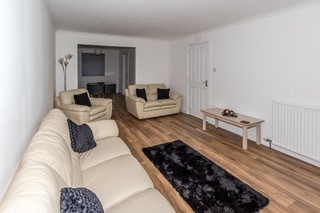 Three bedroomed terraced dwellinghouse in central village location, in an ideal commuter position only minutes from Dyce and a short drive from Aberdeen, Westhill and Inverurie. 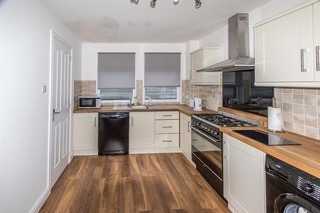 The property has been recently completely renovated throughout and has spacious accommodation including an open plan lounge dining room, fully fitted kitchen, three bedrooms (one with en-suite) and family bathroom upstairs. It benefits from gas central heating and double glazing. Completing the package is a combined patio / off-street parking area to the front. Please note all home report issues have been addressed during refurbishment works. directions: From Aberdeen take the A96 dual carriageway heading towards Inverness and at the "Blackburn" roundabout, turn right where indicated towards Blackburn. Continue along the road into the village and then turn left after the hotel into Elmbank Court, following the road around to the left, number 3 is situated on the left hand side. 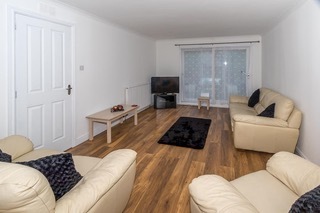 location: The village offers a good range of amenities, including shops, a primary school, post office and local hotel with lounge facilities. In addition there is a community association which actively promotes a variety of local activities. Blackburn is within easy commuting distance via a good commuter road of both Aberdeen City centre, Inverurie and Westhill. Excellent public transport facilities are available close by. entrance: The entrance door is at the front of the property off a private courtyard. Entrance vestibule has ceiling light fitment. 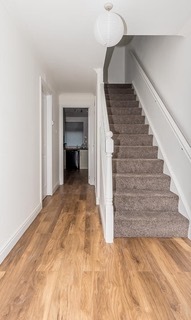 Decorated neutrally, with wood effect flooring. Door gives access to storage cupboard which houses the central heating boiler. hallway: Opaque glazed door leads to the inner hallway. Double door storage cupboard with shelf and hanging rail which also houses the fuse box. 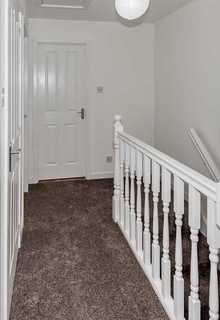 Hallway gives access to the lounge, kitchen, stairs to upper floor and under-stair shelved cupboard which has light. Ceiling light fitment. lounge: 17’2” x 11’10” (5.23m x 3.60m) The lounge is located to the front of the property with sliding patio doors. Ceiling downlights and coving. Decorated neutrally. Wood effect flooring. Television point. On open plan archway leads to the dining area. Albeit this could be used for a range of uses, a family room, playroom etc. The lounge is extremely spacious, bright and airy. dining room: 12’3” x 9’4” (3.73m x 2.84m) The dining room is located to the rear of the property and has a window which provides lots of natural light. Ceiling light fitment. Coving. Decorated neutrally. Wood effect floor. 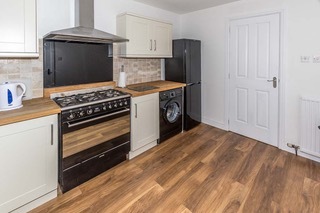 kitchen: 12’3” x 8’10” (3.73m x 2.69m) The kitchen which can be accessed from the hallway or from the dining area and is located to the front of the property with double window flooding the room with natural light. The kitchen is fitted with a range of base, wall and drawer units. Single bowl stainless steel sink with mixer tap and drainer. Gas SMEG Range cooker. Washing machine, dishwasher and stand-alone fridge-freezer. Cream frontals and wood effect work tops. Tiled splashbacks behind worktop area. Ceiling light fitment and wood effect flooring. stairs to upper floor: Carpeted stairwell leads to the upper floor. Decorated neutrally. Ceiling light fitment, access hatch to loft. The upper hallway gives access to the three bedrooms, family bathroom and a shelved storage cupboard which houses the hot water cylinder. bathroom: 8’2” x 6’5” (2.48m x 1.95m) The bathroom has opaque window to front. Tiled to dado height in the entire room with tiled flooring and to full height in shower area. Downlights and extractor fan. Fitted with wash-hand basin, W.C., bath and separate shower cubical. 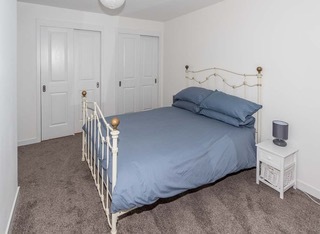 bedroom: 12’5” x 9’0” (3.78m x 2.74m) The master bedroom has two double sliding door wardrobes with shelves and hanging rail. Window to rear and ceiling light fitment. 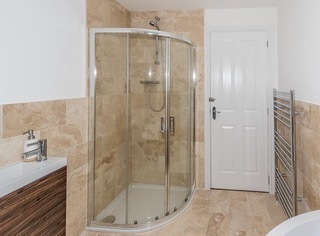 Door gives access to en-suite shower room. 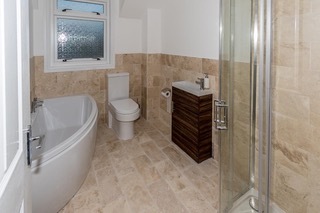 en-suite: En-suite shower room is decorated neutrally. Ceiling light fitment. Tiled full height in shower area and to dado in rest of room. Tiled flooring. 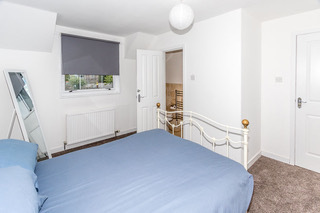 bedroom 2: 12’10” x 9’3” (3.91m x 2.81m) The second bedroom is also a double bedroom with window to front providing lots of natural light. Ceiling light fitment. Ceiling coving. Decorated neutrally. Television and telephone points. Double door wardrobe with shelf and hanging rail. bedroom 3: 9’4” x 9’0” (2.84m x 2.74m) The third bedroom is also located to the rear of the property. Large window provides lots of natural light. Ceiling light fitment. Decorated neutrally. Single door, shelved, cupboard with hanging rail. outside: To the outside of the property there is a patio area and car parking.